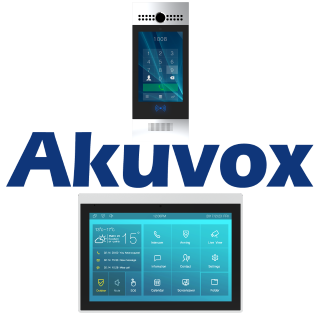 Akuvox, a Chinese manufacturer of VoIP products, is expanding heavily into Video Intercom products with disruptive pricing targeted for commercial use. They are one of 50 video intercom manufacturers (see directory) in this growing field. ******, * ******* ************ ** **** ********, ** ********* ******* into ***** ******** ******** **** ********** ******* ******** *** ********** use. **** *** *** ** ******* ******** ************* (*** *********)** **** ******* *****. ******* ****** ******** ****, ****** ******* ******* ** **** ******** ****** ** was**************-*** ******* ****, * ********** ************ **** **** ******** **** ******* (not ** ** ******** *****-***** ***** *******). **** **** ****, shortly ***** ** ***********, *** ******* ********** ***** ******* ***** intercom ********. *** ******* ** ****** ****** ***, *********, ********** ****, *** **** **** ** *** ** *** *** ** 2015. *&* *** ************* ********* *** ********* **** ****** ****-*** Group. ****** *****, ***** *** *** ****-******* ***** ******. **** ****** *** available **** ****** ******* **** ** ****, ********* *** ***** cameras. *******,****,******* *******-***** ***** ***** *******,****, ********** ***. ********* ***** *****, *** *****-****, **** ** ******* ***** ****** *** ********** ***** ******. **** ***** ******* *************, ******'* ******* ******* ** ************* *** compared ** ******* ******. *** *******, ******'* ***-***** *****-****** ********, the******* * $*** ****, **** **** **% ** **** ** charges *** ************* ** ******** **** **** ********** ********* ************** *******. ****** ** **** ********** **** ******* *********** **** ***** *** Hikvision ** ***** ** ******* *** ********. *** *******, ********* *********** *********'* ********-*. ***** **** ******* *** ****** *** ** *******, ****** products ***** ***** **** *** **** **** **** ********* ******* commercial ********. ****** ** *** ******* ** *** ********** *** **** ***** and ********* ***. ******* ****, ******** ******** **** **** *****-****** retail ****** ******** ** ********** *** ****** ** *********** * response. ****** **** *** ***** ***-**** ** ****-**** ********, ******* *** options ** **** **** ******** *******, ******** **** ** *** installs ** **** ************ **** ** ********. ****** ********** *** *** ** ***** *** **** *** **** direct ************ **** *** ***** *** *******, ****** ****** **** as ****, ***** *** *********. ********** ******** ***************** ** ******* ** ***** ******* ** ****** ************* **** as**,****, *********, *** *****. ********* *** ***** ***** ***** ******** for **** ******* ************ ** **** *** ********** ** ***** surveillance *****/*** *******. ******'* ***** ******* ** **** **** ** indoor *******, *** ***** ** * ******* ****** *** *****-*********** units ******* ****** ********. *********, ****** ** ************ ******* *** these ******** ** ***** ****** *** *** *********. *** *********,******************$*. **/***** *** ******. ****** ** **** *************, ********** ***-***** ***** ***** *** available ** $**/***** **** ******. *** ******** ******* ** **** ****** ******** (*. *.,*** ********* ** *** *****) ** *** *** ** *******. **** actively ******* ******* ** ********* *** ********** *** ***-***** **** third-party **** ** **** (** **** *** ************ *******) ********** launchers. *******, *** ****** ** **** *** ******* ******** **** (*. * and *. *) *** ** ****** *********, ** *** ******* ******** updates *** **** **** ********* ************* ****** **** ******* **** (v *.*). ************, ****** *** ******* *** **** ***** ********* manual ************ ** ****. * *** ******* ********** **** *******, ****** *** ****** ****** *********** *** ********* ****** *******. While **** *** *** ****** ******'* ****** ***********, ** ****** caution **** *** ****** *********** ******* ***** ******* ************* ** the **********. ****** ********* ******* ** ********** *** *****-****** *********. **** **** a ***** ******** ** ************* *******************, * ******* ** *** ** *** ******** ***** ****** to ******* *** *******. ******** *** ***** ******* **** ** education (*.*. ********* ********/**** **********) *** *******. ******'* ******** ** *** *** ******* ***** **** ** ** physical ********. **** ** ********* ** *** ***** ********, **** as ***** ************** *** *******************, ***** ******* ******** *** **** ******* ******** ************ ************ *** ******* ******. ** *** *** ********** **** ******** ************ **** *** or *******. ** ******,********** *** ** ******* ***** ****** ***************** *** ****** ******. ****** *** *** ********* ** ******* *** ***-**** ******** ****** in *** **** **** ** ***** ******** ***** **** **** so ** ** *******. *** ****** *** *******'* ******** ******* and *** **** ********** *** *******'* ************* ***** ******* ******* to ** ****. **** ** *********** ******* ****** *** ******** *** ****** ******** on *** *******. ***** **** ******** ******** ** *** ******* **, * ********* playground *** ************ ******* ** ***** ****, ***** **** ** hacked *** ********* **** ******* ** * **** ***** ****** of ****. ****** ***'* *** *****, ** **** ******* *** another ****** **** *** ****-**-***-****** ********* ** ***** ************* *** will ****** **** ******* ******* ** *** ******** **** ******* to ** ***********. * ***** *** ** ***** *********. *** ******* *** ******* **** ** ***** ********* *** **** advanced *** ************ **** **** ** *** ***** ***/** ********* including **(**** ** **** **** **** ************* *** ****** *******). It ** *** **** **** *** ******** *** *****, **** are ******** * **** ****** **** ****** ********** ***. ** you *** ********* **** ***** ******* ******* *** *** ***** ones *******. ******* ***** ******* **** ** ***/ *** **** you *** **** **** *** ****** (***) *** ****** **** communication ****** *********** ** ****. * **** **** ** * **, *** ***** ** *****. I ***** **** ** *** *** *** ********, ************** ***** and ******. **** **** ***** ***** *** ** *** ** 100% *** ** *** **** ** ****** ** *****, ** data *******. **** *'** ***** ** **** *** *** *** *'* ****** like ** *** *** **** *** ** ***** *****. * agree **** **** *** ********* ** ** **********. *** *** just ** *** ***** ******** *******, ** **** ** ****. As *** ***** ********* ** **** ** ***** *****, *** the ************* ********* ** ******, * *** *** *** **** will ******** *** ***** ** ****** ****** ***** **** ****-*** readers. ***'* **** ** *** ** **** **** ** ******** their ***** **** ******** *** *** & **. ** *** *******. Add ** *** ***** *** ***'** *** * ********* ****** with *** ****** **** ********* ******** - ****** ******** *** those **** ***** *** ** ***** * ****. ******* ** readers **** ***** ***** ** **, ** ****** ***. *** in *****, ********* *** **** ******* **** *** ** **** a ****** **** **** ******* * **** ********** ******.